Il Primo libro de la canzoni francese. Venice : O. Scotto, 1536/6. 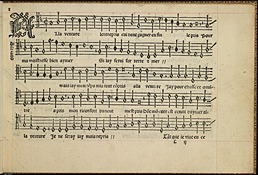 This, the only musical item in the Gordon Collection, is a single tenor partbook from a set of four published in Venice by O. Scotto in 1535 or 1536. The other three reside in the Bodleian Library, Oxford (soprano) and the Bayerische Staatsbibliothek, Munich (alto and bass). The four partbooks have been separately known but until now no one was able to put them all together. This publication was one of the very first to focus on a type of French chanson generally known today as the Parisian chanson, a type that was simpler and more “popular” in style than its immediate predecessor, the more elaborate, “learned” chanson of Josquin des Prez, Nicolas Gombert, and others. The partbooks’ table of contents identifies three composers: Adrian Willaert, Claudin de Sermisy, and Jehan Lhéritier. Three other composers—Jean Richafort, Pierre Moulu, and Mathieu Lasson—are also represented but not named. Of the twenty-three pieces in the set, twelve are known in no other source. 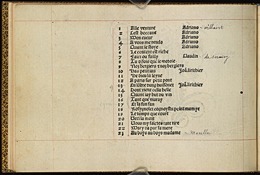 This list includes four attributed to Willaert, one attributed to Sermisy, but not matching his known setting of the text in question, and seven anonymous. These pieces can now be offered for the first time in their complete state. 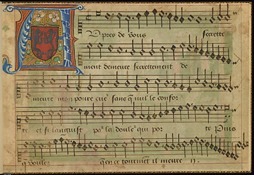 At some later date, presumably when the present binding was added, a single page from a manuscript chansonnier was tipped in with the printed partbook. This single sheet shows on one side the soprano part to Sermisy’s famous Au pres de vous and on the other a curious illustration whose iconography has so far eluded explanation. The picture shows a shawm player performing outside a city wall. In front of the player is an open book of musical notation that appears to float in midair, as do a number of blocks from the city wall itself. Within the wall stand several figures of both genders, relatively far from the player, who seem to be engaged in conversation, and backed up against the wall, placed in the background between the group and the player, can be seen a row of houses. The illustration appears stylistically to be French and to date from the approximate period of the printed partbook. Two other manuscript partbooks from the original set of four survive—the alto in Florence (Laurentian Library, Cod. 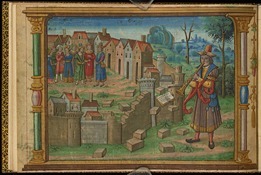 Ashburnum 1085) and the tenor in Paris (Bibliothèque Nationale, M. Rés. 225). It appears that each of the four manuscript partbooks originally included an illustration, but today only the alto partbook retains its illustration. 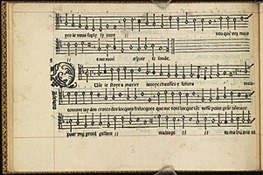 The first leaf of Gordon 1535 .A64, with illustration and the notes for Au pres de vous, has been torn from the soprano partbook, whose whereabouts are unknown.